Everyone suffers from the adverse effects of stress to one degree or another. 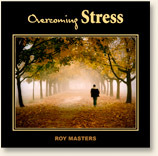 However, although few fully understand the true nature of stress and its impact on us, everyone can benefit from the solution contained in this audio, Overcoming Stress. The audio exercise in this download, when properly followed, is the ultimate tool for effortlessly overcoming stress, depression and illness and for achieving true personal and spiritual growth. We suggest you may also like to practice the "Be Still and Know" exercise, in conjunction with "Overcoming Stress"